Today we commemorate the first anniversary of one of the most horrific Israeli crimes against the Palestinian people and against humanity in general. On this day last year, the Zionist entity with all its advanced and sophisticated weapons, paid for by the US and the EU, launched a 23-day “war” on the unarmed and besieged civilian population of the Gaza Strip. One and a half Million Palestinians live in the small Gaza Strip, including 1 million refugees who were expelled from their homes in Palestine in 1948 by Zionist terror groups. With an area of only 365 km², the Gaza Strip has a population density of 4000 resident/km², making it the world’s most dense area. Israel knew this and nevertheless didn’t hesitate in attacking a densely populated area that is under siege from all sides and where people have no place to run to in search of shelter. Israeli leaders, aka the war criminals of our time, kept appearing on almost all TV stations, including Al-Jazeera, to address the world in general and the Palestinians in particular and tell them in all audacity that they want what is best for Gaza. I suppose Olmert, Livni and Barak were not lying because, to these war criminals, the best thing that could happen is a total annihilation of the Palestinian people. Fanatic politicians and Rabbis called openly for the elimination of Gaza and wiping it off the map as the world turned a blind eye. One example is the Ashkenazi Chief Rabbi Yona Metzger who wanted Gazans to be dumped in Sinai. He even asked the US, EU and the UK (Israel’s staunch supporters) to become even more of a partner in crimes against humanity by arranging for the transfer of the Palestinians out of Gaza. Did any of these countries protest these racist calls coming from no less than a Chief Rabbi? No, I don’t think so, because countries willing to change their laws and compromise their judicial integrity for the sake of protecting Zionist war criminals are indeed partners in the war crimes committed against the people of Palestine! In 2005, accompanied by world media coverage, the Zionist entity performed one of its many theatrics: the so-called Gaza disengagement. Crying Zionist colonists were shown “kicked out of their homes”, i.e. Illegal houses built on stolen Palestinian land, and “kicked out of their fields” i.e. fields stolen from the Palestinians. What a great sacrifice indeed the Zionist state is willing to make in the name of peace! But to mention that this land is occupied land, that Israel had no right to this land in the first place, that the sacrifice-nonsense is nothing but pure Hasbara, or to mention that these illegal colonists were resettled in the West Bank was “not good for peace” and was better left out from the news. Israel claimed then that it had ended its occupation of the Gaza Strip; a claim used till today to justify every attack on Gaza. The fact is: the occupation of Gaza became tighter, Gaza had changed from being an occupied land into an open air prison, where its entire population is locked in, nothing comes in or leaves without Israel’s consent. Israel controls the land, air and sea borders of Gaza, not even a bird can fly over Gaza without Israel “giving its permission”. This is the “end of the occupation” which western media chose to celebrate. Through controlling Gaza’s entrances, Israel controls the lives of the people there; decided how much food and essential supplies enter, how much medicine and how much fuel and decides whether Gazans get to starve to death or not. And it did decide: Israel decided that Gazans should die a slow and painful death through the siege! In 2006 came the second stage: Hamas won the Palestinian elections fair and square. The whole world agreed that the elections were free and democratic; in other words the Palestinian people had decided! But this decision did not agree with Zionist and American plans, so Hamas, the democratically elected government was boycotted by Israel, the US and their tails: other western and Arab regimes and the Abbas entourage who couldn’t believe that the Palestinians have had enough of their political, financial and moral corruption and of their collaboration with Israel. All efforts to form a unity government were mainly sabotaged by the so-called PNA upon the orders coming from Washington and Tel Aviv. This state of affairs led to the events of 2007 after which Gaza retained its Hamas-led government while the Abbas-led “government” forced itself on Areas A and B (less than 60% of the West Bank), the latter being an illegal “government” according to international standards and customs, having not won the last elections, but being installed as a substitute to those who did win. And so, while the Abbas’s “government” got support to continue oppressing the Palestinian people in occupied West Bank and to play the Police for Israel, the democratically elected government in Gaza was boycotted and the people of Gaza were the ones to pay the price for believing in democracy and for practicing their right to vote freely. The whole of the occupied Palestinian Territories are under siege, through border control, the 630+ checkpoints, the illegal Zionist colonies, the Jewish-only roads, the restricted area. 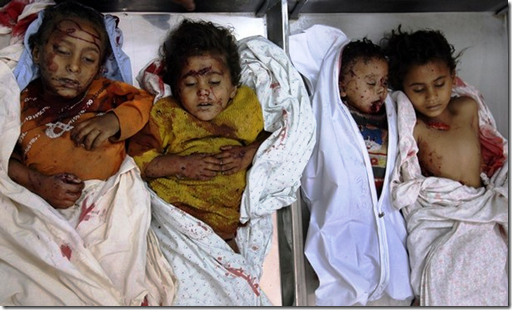 But for Gaza things got worse; It was sealed off completely, cut off from the entire outside world. All entrances to Gaza, including those on the Egyptian side, were closed, and only the minimum amount of basic supplies was allowed in causing a constant lack of food, medicine and fuel. Few trucks are allowed in, and often the borders are sealed off completely. And in blatant violation of human rights, in 2006 Dov Weisglass, an Israeli senior government adviser, said that “the idea is to put the Palestinians on a diet but not to make them die of hunger.” In other words; to kill them slowly so no one notices it and blame us for it. Coming from Zionists, this is neither surprising nor unusual, for this Zionist entity actually used every known Nazi method against the Palestinians short of the gas chambers in their known form, so that when confronted with their Nazi-like behaviour they can use the gas-chambers-card to defend themselves: We haven’t used gas chambers against the Palestinians, so how can you compare us to the Nazis (I personally heard this over a hundred times from Israelis and Israel-supporters), as if all other Nazi methods used against Palestinians are acceptable. 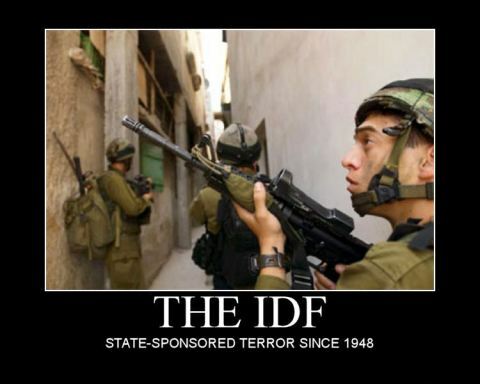 Fact is; Israel used and is using its own version of the “gas chambers” to kill Palestinians. The Zionist entity used chemical and poisonous-gas weapons against Palestinians in 1967, 1988, 2001, 2004 and 2006 (In the Beginning Was the Word; that of a Palestinian). International law protects civilians and forces occupying powers to protect civilians, but the Israeli government considers itself above international law. This Zionist entity blatantly showed yet again its disrespect for human lives when its then prime minister and war criminal Ehud Olmert said about the siege and cutting off Gaza’s fuel supply: “We will not allow them to lead a pleasant life,… As far as I am concerned, all of Gaza’s residents can walk and have no fuel for their cars.” Electricity blackouts became daily, drowning Gaza in darkness. Knowingly and deliberately punishing civilians and bragging about it openly is a war crime. Cutting off the fuel supply necessary for the running of the only power plant in Gaza means no power supply for hospitals, thus intentionally killing patients. And while the whole world watched and kept silent, the so-called “only democracy in the Middle East” reaffirmed in January 2008 the illegal und inhumane siege of Gaza and the starvation of its civilian population through its Higher Court. Almost everything from tea, coffee, sausages, chocolate, to clothes, shoes, fabrics, needles, threads, books, crayons, matches, candles, light bulbs, sheets, mattresses, blankets, cups and cutlery were not allowed anymore into Gaza. While the Zionist Hasbara again and again claimed that Israel had ended its occupation in Gaza, the Zionist entity continued its attacks on the Strip: Shelling of residential areas, targeted killings and Israeli army incursions occurred almost on a daily basis. Israel continued killing Palestinians in Gaza and then claiming it had left Gaza. Israel continued controlling the borders to Gaza and then claiming it had left Gaza. Israel continued kidnapping Palestinians from Gaza and then claiming it had left Gaza. 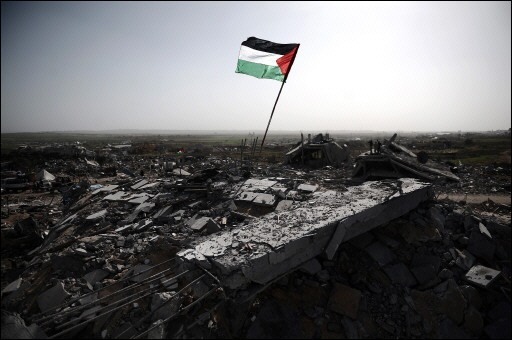 Israel continued razing fields and destroying houses in Gaza and then claiming it had left Gaza. Israel continued sending its soldiers into Gaza to kill, kidnap and destroy and then claiming it had left Gaza. And when an Israeli soldier was seized on Gaza soil, Israel claimed he was kidnapped. The Palestinians can’t even leave Gaza without being shot dead by snipers hiding behind walls and inside towers or in helicopters, it is IOF soldiers who keep entering Gaza, leaving death and destruction behind them and taking hostages, mostly farmers, fishermen and children. And so, slowly, the Zionist entity transformed Gaza into a concentration camp, and prepared it for its version of the Holocaust and the gas chambers; prepared it for a Zionist-made “bigger Shoah” according to Israeli former deputy defense minister Vilnai. It is well-known now that the Israeli war criminals had prepared for the Gaza genocide 6 months in advance. When the plan was discussed by the Zionist Cabinet all war-criminal ministers without exception voted in its favour. So, while spreading misleading information about easing the siege and negotiating a ceasefire, Zionist leaders had already given a green light for the attacks. Israel as usual claimed it was defending itself against “terrorists”, but ended up showing the entire world that the only terrorist around is the Zionist entity itself. During this latest Israeli genocide in Gaza 1419 Palestinians were killed by the IOF, including: 326 children, 111 women, 367 students, at least 15 teachers, 16 medical personnel, 21 farmers, 2 fishermen and 92 labourers. Over 5300 Palestinians were injured by the IOF attacks, including 600 who suffered permanent disability and 221 required amputations. Of the 1419 victims, 140 were killed by Israeli artillery shelling, “473 Palestinians were killed by missiles from Israeli fighter jets, 519 from unmanned drones, 92 from Israeli military helicopters, 7 from Israel warships.” 92 Palestinians were shot dead by IOF soldiers, including 27 children. Of those shot dead “53 were shot exclusively in the upper body, 10 in the lower body, and the rest in both the upper and lower body.” According to doctors present: “the most horrific war injuries in men, women, and children of all ages in numbers too large to comprehend. The wounded, dying, and dead have streamed into the overcrowded hospital in endless convoys of ambulances and private cars, and wrapped in blankets in the caring arms of others. The endless and intense bombardment from Israeli air, ground, and naval forces have missed no targets, not even hospitals.” One massacre followed the other. The Israeli soldiers spared neither child, nor women nor elderly. Palestinians were shot dead while seeking refuge or medical help, others were gathered in their homes by the IOF to have their homes destroyed over their heads. Total destruction accompanied the war. The infrastructure of Gaza was completely destroyed: Residential areas, hospitals, clinics, schools, mosques and even the UNRWA headquarters didn’t escape the IOF shelling. During the “war” over 50,000 Palestinians were displaced. According to the Palestinian Centre for Human Rights 2864 housing units were completely destroyed by the Israeli shelling, affecting 19,592 Palestinians. Another 5,470 housing units were partially destroyed, affecting 32,250 Palestinians. Some 16,000 houses were moderately damaged, affecting tens of thousands of Palestinians. Today, some 20,000 Palestinians remain homeless. At least 280 schools and kindergartens were damaged, including 36 UNRWA schools. 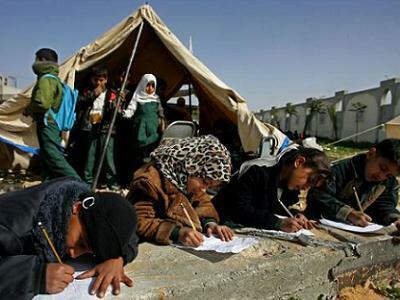 10 schools, 8 kindergarten, 15 hospitals, 43 clinics and 30 mosques were completely destroyed. Gaza infrastructure was also completely hit. Electricity, water and sewage networks were severely damaged and are on the brink on collapse. Repairs to the networks are almost impossible due to lack of building material. Agricultural land was damaged by IOF attacks and razed by advancing IOF tanks, leaving 46% of Gaza’s agricultural land unusable. The “war” lasted 23 long days, with some 1419 Palestinians killed and over 5300 injured. After realizing that despite all the death and destruction it had caused, the Gazans will never give up and will never surrender, and that in fact it had lost the war against an unarmed population, the Zionist entity declared a “cease fire”. It was only another charade, primarily to save itself from admitting it had lost and is surrendering, and to give the impression that it was leading a “limited operation”, as it termed this “shoah”, that was over. The truth is, it was never over. Gaza remains besieged, controlled and under continuous shelling. Despite announcing a “ceasefire”, Palestinians returning back to their homes and fields in areas close to the border were shot dead at by the IOF. Farmers are shot at while working in their fields, fishermen can’t go fishing in their waters without being shot at or kidnapped by Israeli naval vessels, Israeli war planes and drones continue to fly over Gaza and fire missiles at Palestinians, Israeli artillery continues to shell residential areas killing and injuring Palestinian civilians in the dozens. 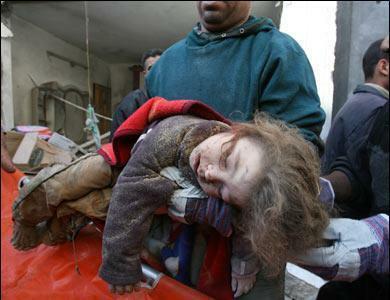 The Zionists still bombard Gaza whenever it suits them. This “war” is not over: Palestinians are still suffering. People still die as a result of the injuries sustained during the war. Explosive charges left by the IOF still cause the death of Palestinians who step on them. Children are orphaned forever. Those handicapped will remain so forever. Those wounded are still being treated. And the psychological wounds will never heal. Thousands are still homes and most homes demolished are not rebuilt because Israel is not allowing building material into Gaza. Lands were razed and bombed by the IOF with chemicals weapons, contaminating the soil and rendering them barren. The already catastrophic water situation was made even worse by the attacks. Water wells were also polluted by the bombing, contaminating the water resources and rendering them undrinkable. During this genocide, Israel used illegal, forbidden weapons against unarmed civilians who were besieged and had no place to run to, no shelters in hide in. 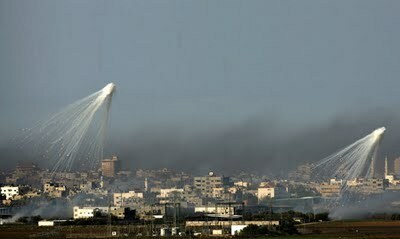 “Human Rights Watch (HRW) stated that the Israeli Army is using White Phosphorus in its artillery shells against the Gaza Strip. Researchers of HRW said that they observed on January 9th and January 10th, several artillery shells fired by the Israelis near Gaza and Jabalia, and that these shells apparently included white-phosphorus. Using this type of shells, in this manner, is banned by international humanitarian law, the group added. The shells are capable of burning human flesh right down to the bone and are capable of setting structures, fields and other civilian facilities on fire. The group added that using this kind of shells against the most populated area in the world, Gaza, causes magnified harm, and called on Israel to stop firing these shells.” The New Weapons Research Committee states in a recent study that: “the 2006 and 2009 Israeli bombings on Gaza left a high concentration of toxic metals in soil, which can cause tumours, fertility problems, and serious effects on newborns, like deformities and genetic pathologies.” According to the evidence collected by the group, Israel used white phosphorus, Dense Inert Metal Explosive (DIME), sub-lethal targeted weapons and experimented new non-conventional weapons on the civilian population of Gaza. 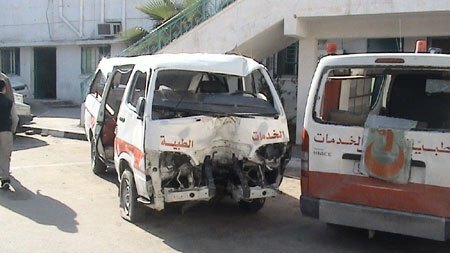 According to Norwegian doctor Mads Gilbert, who worked at Al-Shifa hospital in Gaza: “many (people) arrive with amputations, with both legs crushed”, and “with wounds which I suspect are produced by Dime weapons”….“Human Rights Watch (HRW) reported from Jerusalem on “Israel’s repeated firing of white phosphorus shells over densely populated areas of Gaza during its recent military campaign was indiscriminate and is evidence of war crimes”.” After the “war”, HRW reported finding “spent shells, canister liners, and dozens of burnt felt wedges containing white phosphorus on city streets, apartment roofs, residential courtyards, and at a United Nations school”. These were manufactured in the United States. After Israel’s “war” on Gaza, the Palestinian Addameer Association for Human Rights registered an increase in miscarriage rates, cancer among children and elderly and an increase in the number of babies born with birth defects. The reason for this increase is the use by the IOF of weapons containing radioactive and toxic material. Addameer reported some 27 cases of babies with birth defects during the period from August till October 2008, in comparison to 47 cases registered for the same period in 2009, most of the cases were found in Jabalya, Beit Hanoun and Beit Lahia where Israeli shelling and attacks were the fiercest. The Livelihood of most Gazans was destroyed. Farmers risk their lives when working their fields close to the border. Others are not even allowed to reach their fields. Fishermen also risk their lives when fishing in Palestinians waters. Many have been shot at and still get shot at while fishing. Some 20 fishing boats were confiscated by the Israeli army. Israel had restricted the dishing area open to Palestinians to only three nautical miles off Gaza’s coast, which means little catch for fishermen since 70% of usual catch lie beyond this point. Many bakeries had to shut down due lack of fuel. Many workshops and factories were destroyed by the IOF shelling, and small businesses can’t afford to pay their employees anymore. In January 2009, and while Israeli artillery, warplanes, naval vessels were bombarding Gaza, current Israeli foreign minister Lieberman told a crowd at Bar-Ilan University that Israel must continue its operation. Despite all the deaths, the destruction, and probably because of all the death and the destruction Israel had inflicted on the civilian Gaza population, Lieberman wanted the genocide to continue. He wanted Israel to ‘continue to fight Hamas just like the United States did with the Japanese in World War II.’ In other words, Israel’s foreign minister wanted his entity to nuke Gaza. The Zionist entity; a nuclear power, used illegal and new non-conventional weapons, such as white phosphorous, DIME and sub-lethal targeted weapons, to attack an unarmed civilian population, but could not break the will of Gaza. The world’s fifth strongest army used its entire naval, air and ground war apparatus, including drones, apaches, Cobras, F16s and Merkavaks, to attack a besieged civilian population, but could not break the will of Gaza. This latest genocide only proves yet again that the Israeli occupation army truly deserved its title: the most immoral army in the world, or better said: the most terrorist army in the world! Thus, it is our duty to bring these Zionist war criminals to justice. It is our duty to bring all those individuals and regimes who committed, assisted or covered up the Zionist war crimes to justice. We owe it to the innocent victims; those dead and those still suffering. We owe it to all those Palestinians who sacrificed their lives and their freedom for Palestine. To owe it to all Palestinians steadfast in occupied Palestine. We owe it to the future generations of Palestinians. Today, while free, honest and conscientious people around the world commemorate the Gaza genocide and stand as one in support and in solidarity with the people of occupied Palestine, the Zionist entity threatens Gaza with a new genocide, the collaborator Abbas of the “PA” swears that he will not allow a third Intifada against the Israeli occupation and the Egyptian regime builds its own wall of shame along the border with Gaza to fully strangle the people of Gaza. Early 2008, the people of Gaza brought down the wall between Gaza and Egypt. Hundreds of thousands in Gaza and millions around the world celebrated the fall of that wall. Although that freedom lasted only a week, it sent a message to Israel, to the “PA” and to Egypt: Gaza will rise out of the rubble of genocide to break the chains of siege and treachery and to embrace the coming freedom. It sent a message to the whole world: the Palestinian people will be free, we will never give up the fight for our legitimate rights and for our freedom, for it is our right to live free in our homeland. We will rise again, break free of all the concentration camps and will march as one towards Jerusalem.